Tammy showing off her fabulous chocolate mini-cupcakes! 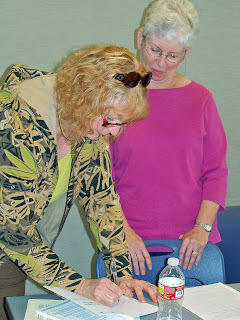 The November meeting of PACGFS was held on 11/20/12 from 12:30 to 2PM at Prescott Public Library Founder's Room B. 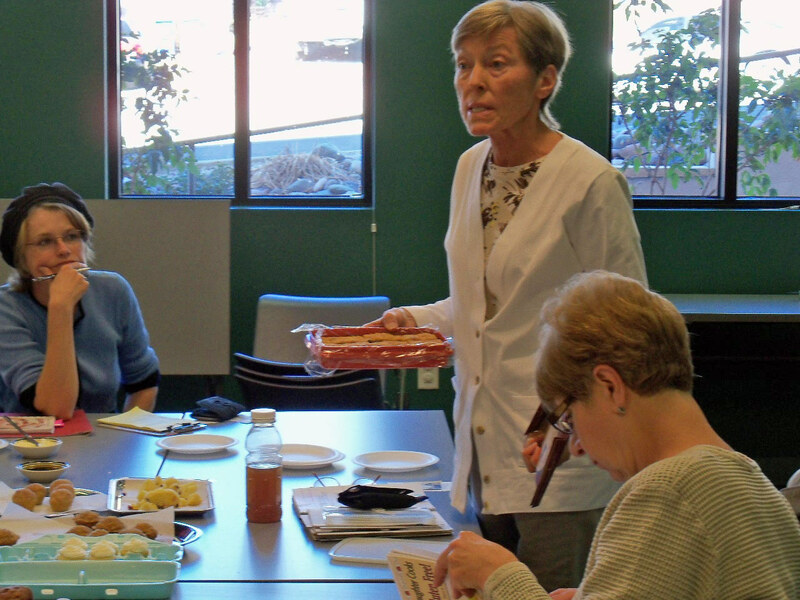 Part of this month's meeting focus was on Tammy K's gluten free baking business: That's It! Gluten Free Baking. 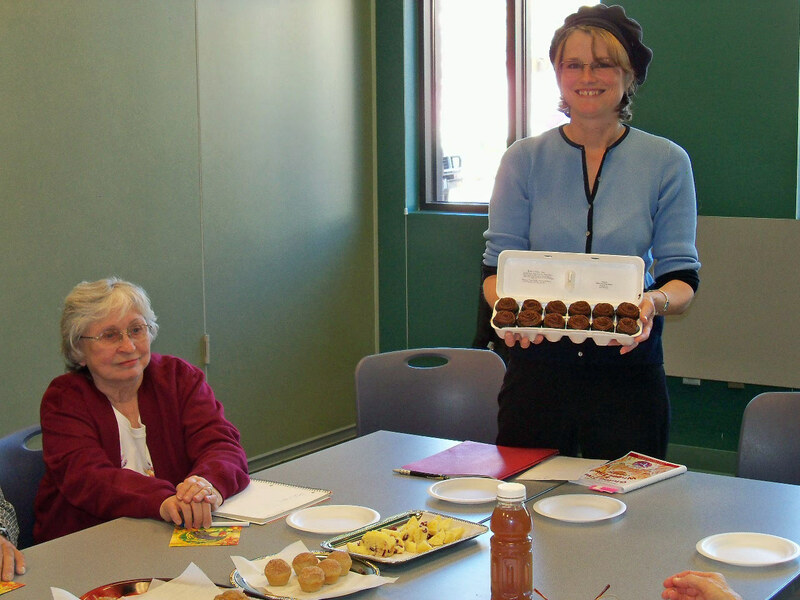 Tammy shared information with the group about her business and provided wonderful samples of several mini-cupcakes. 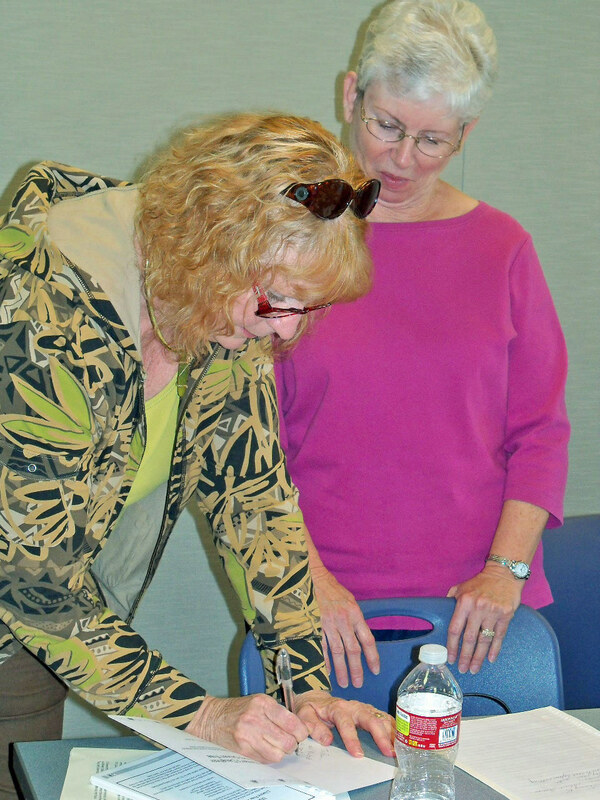 Diane signing new member Pam's cookbook. 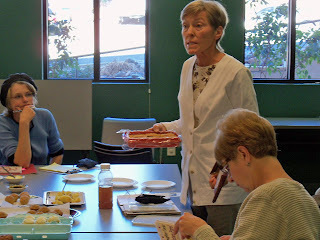 Diane J. presented information to the group about (holiday) baking, gluten free, with a focus on yeast breads. She discussed gluten free flour blends, various GF flours, and special tips for successful gluten free baking with yeast breads. She brought samples to share of a savory herb bread, multi-grain bread, and a cinnamon roll. Diane also signed some of her new cookbooks for group members. Toni sharing her healthy blondie brownies. Several people mentioned some positive experiences that they had had recently with restaurants that were offering gluten free dining options. 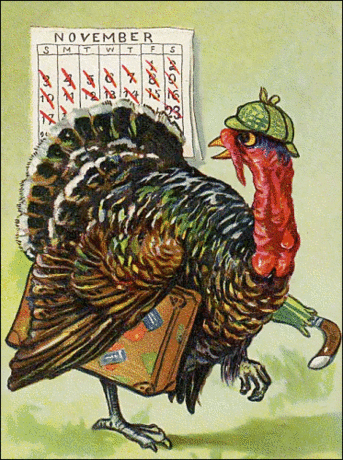 These included Nick and Willie's Pizza, Wildflower Bread Company, Prescott Station, and Gurley Street Grill. Also,the El Gato Azul owner, Barry, had just notified the group that the restaurant is now carrying gluten free bread and tortillas as well. It just keeps getting better and better, doesn't it?! We are looking forward to seeing you at our next meeting on December 18th; same time, same place. Holiday Baking...Gluten Free! will be presented by Diane J, and is the topic of November's meeting at Prescott Public Library at 12:30PM on Tuesday, November 20th. Diane J will present information on gluten free baking as well as some wonderful samples of her GF artisan breads! Also, those of you who would like Diane's latest cookbook: "The Farmer's Daughter Cooks Gluten Free" autographed, please bring your books to the meeting. She will have new inventory of her book on hand at the special PACGFS member pricing. Also, we are pleased to announce a new gluten free baking business in our midst! Tammy K, who is an experienced restaurant owner and baker, has started That's It! Gluten Free Bakery here in the Quad Cities area. Tammy will be sharing information about her business at the November meeting, also, and will have samples on hand of her wonderful brownies, cakes, and muffins.You may contact Tammy at her email address to find out more information and to place orders for the holidays. Don't miss this one, folks!